Looking for something new this week to try with chicken? 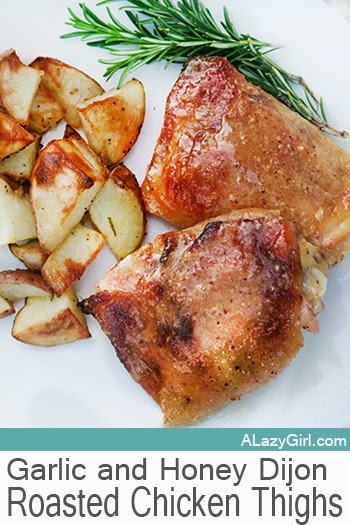 How about my Garlic and Honey Dijon Roasted Chicken? With a savory and lightly sweet taste, this is a chicken that the whole family will love. I used chicken thighs for this recipe, but any part will do, you just pick you favorite :) But cooking time may vary. Pour remaining sauce into a pan and cook over medium until reduced in half. and don't forget to serve with our Perfect Rosemary Roasted Potatoes. Just wanted you to know I made this tonight and it came out great! Thank you! I found it on Pinterest. I made this the other day and it turned out great! I ended up doubling the sauce and (because I'm lazy and wanted a one-pot meal) I added sliced potatoes and frozen brussels sprouts and ended up cooking the whole shebang in a roasting pan. Holy cow did that sauce ever go good with the potatoes and sprouts! I also ended up broiling it for a smidgen to crisp up the chicken a bit more. I will most definitely make this again. Thanks for the great recipe!